What does an IQ score mean? What is the average IQ? After taking an IQ test, you might need some help with the interpretation of your IQ score to understand what your IQ score actually tells you. Is your iq average? Do you have a genius IQ score? The table below shows an IQ scale chart that gives a clear overview of the IQ score ranges as derived from Resing and Blok (2002)1. The table distinguishes different categories based on the height of your IQ score, meaning you gain some understanding of your capacities. About 2% of the population has an IQ score lower than 69. Such a low IQ score often is hard to measure using a regular intelligence test. Very high IQ scores are also hard to determine accurately. This is because you need a lot of reference measurements to determine a specific score reliably. As very high and very low IQ scores simply do not occur often, it is hard to form such a reference group. It's not always easy to understand what IQ test scores mean. Most professional tests, like the culture fair intelligence test or the classical intelligence test, don't only give you a specific IQ score, they also mention an IQ range. This range shows you that your score may vary within this IQ scale, due to error of measurement and because circumstances under which you take a test might be of influence. The average IQ score is always 100, and your personal score tells you your IQ ranking compared to that. IQ scores are based on comparisons with other people who took the test: the norm group. As 100 is the average score, your score tells you how your IQ score ranks compared to other people. There is no such thing as a 'normal iq range', although you can distinguish categories like average intelligence (see the table at the top). Most IQ classifications tend to take care in naming groups the distinguish. So, if you're looking to find what a genius IQ level is, 'very gifted' could be the phrase you are looking for. Although the IQ score is widely known as a psychological statistic, its relation to other statistical measures is lesser known. The best way to explain these measures and their relations is using the normal distribution, also know as the Bell Curve. 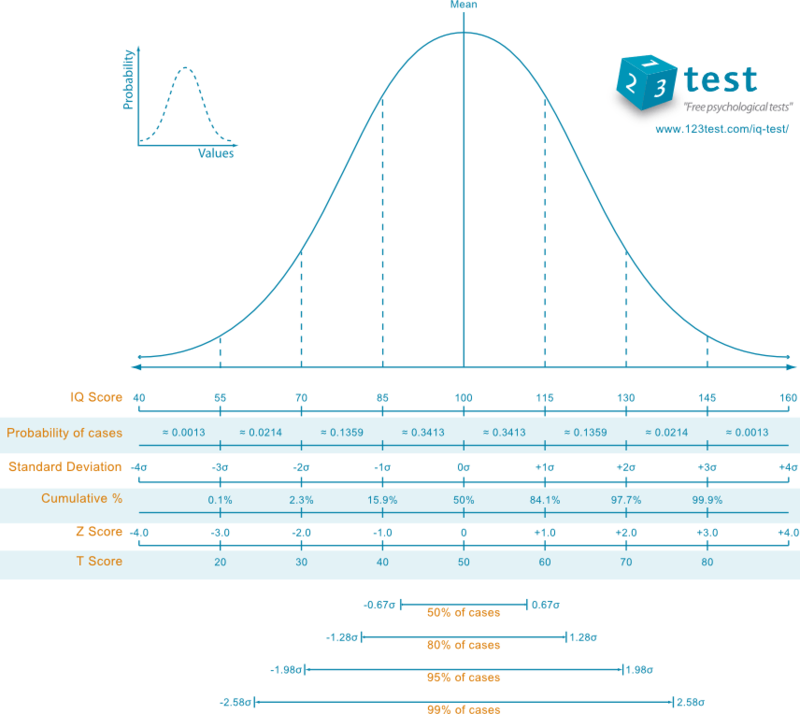 The IQ score chart below shows a visual representation of a normal distribution. Think of the horizontal axis as all the different scores one could possibly get, lowest through highest. The vertical axis represents the number of people that obtain that specific score. An IQ test score is calculated based on a norm group with an average score of 100 and a standard deviation of 15. The standard deviation is a measure of spread, in this case of IQ scores. A standard devation of 15 means 68% of the norm group has scored between 85 (100 – 15) and 115 (100 + 15). In other words, 68% of the norm group has a score within one standard deviation of the average (100). Also, 95% of the norm group has an IQ score within two standard deviations of the average. So, 95% of the norm group has a score between 70 (100 – 30) and 130 (100 + 30). This means scores of over 130 only occur in 2,5% of cases. For example, the Netherlands has 17 million inhabitants. Based on chance, only 25 of these inhabitants would have an IQ score of 170. There would only be one person with an IQ score of 180. Only 4 out of 1000 would score at least 140 on an IQ test. A lot of online tests score you 130 or higher relatively easy. These tests often have a different goal, like collecting information for marketing purposes. The classical IQ test and the culture fair intelligence test require a small fee but will give you a reliable and exact IQ score. Learn more on IQ scores and differences or take a free and short IQ test.